Many applicants express an interest in obtaining the lab results from the insurance underwriting process. Insuring income works with ExamOne and APPS to schedule client exams. Whether your examiner is from APPS or ExamOne, the lab results will be processed by ExamOne. It is ExamOne that has the online portal that allows you to download your results. The applicant receives a notification when results are available, reducing follow up calls and the administrative burden of copying and mailing a paper result. Enter the information from your email to access the system. Please let us know if you are having trouble with this. You will first be asked which company you are applying with. If you are unsure, please email us and we can get this information to you. The key to being able to access your results is the BARCODE. Look for this on the brochure that the nurse left with you. If you do not have this, you can contact the nurse to receive this. It is important to note that some insurance companies do not participate in this program. We wish that they all did, but some carriers simply do not allow for online access. In this case, you will receive a copy of the results in the mail approximately 21 days after your insurance application is closed out as approved, declined, etc. Please click the Register Here button on the ExamOne login page. Select your insurance company name and then complete your profile information. To be successful with your registration, please have your examination bar code number ready. What is my insurance company name? You may either contact your agent or refer to the insurance paperwork given to you during the application process. Why does my insurance company not participate in the program? Your insurance company may offer an alternative process to distribute lab results to their applicants. Please follow up with Insuring Income or the insurance company representative to obtain access to your results. How do I get my bar code number? 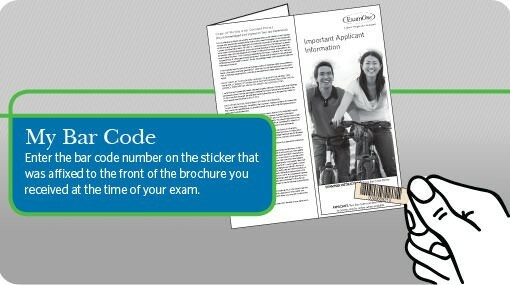 The bar code number is affixed to the “Important Applicant Information” brochure you received at the time of your examination. If you do not have the brochure, use the Contact Us link to request the number. Why didn’t I get my email notifications? Please check your “spam” folder for captured emails. Exam One/APPS’s emails come from InsideLook@examone.com. The subject line is Your laboratory results are available. Why can’t my spouse or significant other register or access their results online? For security reasons, no two individuals can use the same email address to register. Please use a different email address to register and access the results. As individuals, we have different preferences when it comes to viewing information. ExamOne designed the web site with that in mind. The applicant can view the results graphically or as a simple list. They can manage their profile information, save as a PDF, print results and share them with their personal physician. *Online results are for blood and urine specimens only, and availability is subject to carrier participation. Reports with sensitive results such as positive HIV or drugs of abuse are not available via this service.